Even if it’s only for a little while, I’ve missed putting my talents to work in constructive ways, so I’m going to ride out this revival as long as possible. That sentiment applies to more than just my plans for this blog. I decided that despite the part of me that loves to sleep in on Saturdays was practically pulling my eyes closed last Saturday, I got up and went to a PTQ in Fenton. It was my first of the season, and in fact my first of the entire YEAR (I played in exactly one PTQ all of 2011 as well, also in November, where I punted the win and in round to Russel Slack), so while I had been playing a fair amount of MTGO, I didn’t have the highest of hopes. The short version is that I played well enough to take it down. The long version is as follows. I woke up Saturday morning at 8:30, only five hours after I went to sleep. Getting home from work at 2 am has the unfortunate side effect of keeping me up at least another hour, most of which was spent deciding if I even wanted to go to a PTQ all bleary-eyed at BC Comix, a place where I had never won a match of Magic in my life, and I personally considered to be cursed as a result. On the way, I decided to leave I-75 early because there were a few lane closures before my exit, so I meandered through 10 or 15 miles of swampy farmland on Davisburg Road or some such, but eventually arrived just before 10 am. Dismayed that most of the crowd I expected to be there was absent, I said hello to Mike Guptil and Dave Rappaport from PES, both of whom I hadn’t seen in some time. Seriously, I once lost to a Bump in the Night.dec with no red mana in it. I took my seat for registration and build, wondering what business I even had predicting the PTQ habits of people whom I hadn’t even seen at a PTQ in over a year because I just wasn’t attending them. The registration was uneventful, shipping a Pack Rat and some other fair stuff two to my left. Someone at my table decided that a foil Jace, Architect of Thought and some shock lands were good enough to just get up and leave, prompting a discussion about what everyone’s personal price was to simply drop out. I didn’t think there was one for me, but I’m sure an eyeful of foil Jaces might have swayed me. Of course, it was not to be, and I looked over my pools rares first (as MTGO has taught me to do), I wasn’t all that impressed. Slaughter Games, Search the City, and Counterflux were pretty unexciting, while the Mana Bloom, Grove of the Guardian, and Sphinx’s Revelation all seemed decent. I lamented my rares, and the player who registered my pool said something along the lines of it being the worst sealed pool he’s ever seen. Here is the entire pool. That’s an Axebane Guardian in the top right corner, and a 3rd Transguild Promenade obscured by the flash from my camera. If you have trouble reading the card titles, just click the image to zoom. I waffled around, building Rakdos, and then trying Selesnya splashing blue, trying to ignore the incredible mana base I’d been gifted. Transguild Promenade was not a card I’d liked very much in RTR draft, which was essentially how I learned to play the format on MTGO. Losing your second turn could be crucial, and going BACK a turn later in the game could be equally as devastating. Still, this was Sealed, and it was a different game. If I could dodge or get lucky against fast decks in the first few rounds, their numbers would dwindle to nothing, leaving only the lumbering grindy decks that didn’t care about tempo or curving nearly as much. I had the right cards, so I built the best deck to match that plan of attack. The greediest of greedies. Travis Ladoucer would have been proud. That Launch Party should be a Druid’s Deliverance as lucky number 23. 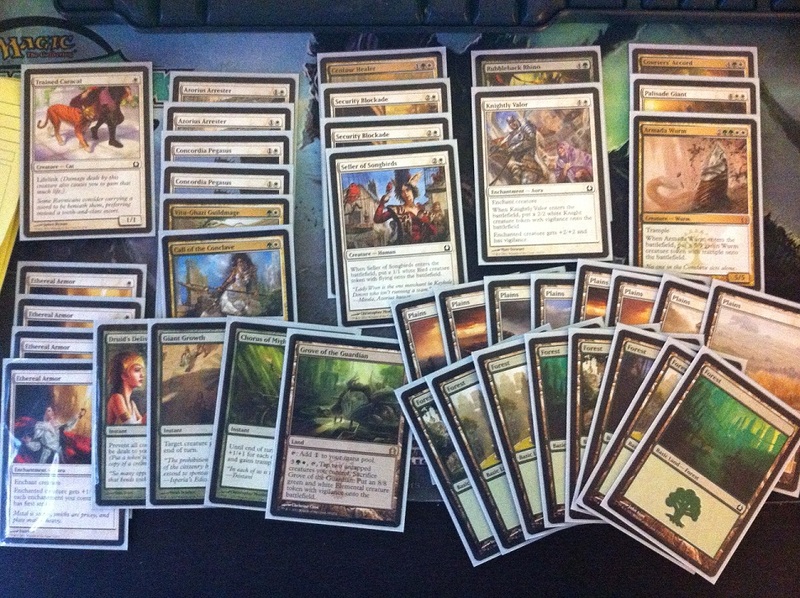 I had a little trouble recalling my maindeck at first. Either way, I added the classic four Forest, three Plains, and three Islands to my deck and was ready to play some long games. I was going to take a picture of all of my opponents in case I couldn’t read my own handwriting when it came time to recall their name, and to put a face to the name even if I DID remember it right. Richard decided to be coy and declined, AND I scribbled down his name illegibly, but lucky for me Planeswalker Points already has the updated information. Richard mulled once on the play, opening on Slitherhead and Sewer Shambler vs. my soon to be usual slow start of turn two Promenade. I recall being quite happy when he Stab Wounded my Vassal Soul, thinking if he’s wasting time Stabbing that then I was going to easily win this game because either my opponent has no gas or he’s just unskilled. Well, I figured out why a few turns later when I looked at my board of Centaur token and Court Hussy both bleeding me to death. The game wasn’t going to last too much longer either way. Richard had not much going on, and I was stuck on four lands. I EOT Dramatic Rescued my Hussy, and spent my Druid’s Deliverance (this play is why I know it was #23) copying the centaur. Richard could only add a Cackler and a Brushstrider, and fell to my random bigger guys with me still at five. I was so preoccupied trying to process his game plan, and how I should craft my own around his at least triple Stab Wound that I didn’t notice right away that he had went from a sleeved deck to an unsleeved one. I recalled him unsleeving just a few cards, so when he opened on white and blue mana, I assumed he also had Swamps so he could Stab people. We played a fairly uninteresting few turns, to the point where I only recall a few key points. One was when I had a weak clock on him to his virtual nothing, and he cast Sphinx’s Revelation for 6 on himself on my end step, and I responded by casting my own for five. I remarked that if this is how the entire PTQ was going to go, playing against triple Stab Wound and having two copies of busted mythics on the stack at once, I had underestimated how interesting the format was. Rich untapped and cast Supreme Verdict, but had no follow up, while I slowly rebuilt my idiot army. Rich had exactly one land left in his deck at the end of the game when he extended his hand. Todd is a solid player I’ve known for a long time, but I usually see him at events trading with people more than playing actual Magic. He happily consented to me taking a picture of him, but since he was the only one who assented, there’s no reason to post it. I can see from my notes that his life total went down by two each time it moved, so I’m guessing I Stabbed a Splatter Thug. He didn’t play much early besides the Thug and a Los Lobos(Lobber Crew) or two. I probably sat there and watched him bleed to death. I played a Dramatic Rescue, but don’t recall why. Honestly, my deck had two avenues of attack. I could make a 3/3 on two and start beating down, or if I drew the Revelation, any of the 2/4s, or Grove I played the waiting game, trying to grind them out with superior card advantage, Stab Wounds, and 8/8s. Game two’s life totals indicate I went the 8/8 route, as Todd’s life goes from 20 to 12 to four. My notes only include cards Todd played, since they were actually so I could recall potential plays from my opponents in later games. I do remember him playing Tenement Crasher, hitting me for six, then playing Faerie Impostor and bouncing it. A Sphinx of the Chimes died to my sideboarded Ultimate Price, and my 8/8 was enough to get the job done. This was the last round I even tried to take a photo of my opponent. Ryan, as you know, declined. Ryan led on Civic Saber into Caclker. I offered Vassal Soul to trade, but he had Mizzium Skin. Still, I mounted a beefy defense with my 2/4s and stalled the game long enough to deal him three a few times, bringing him low enough that either Vassal Soul number two or a Stab Wound finished him. Game two featured an odd play. Ryan played a Stealer of Secrets on the play. I had seen Pursuit of Flight in game one along with Mizzium Skin. I decided to Ultimate Price his Stealer on his upkeep, thinking that if I drew the counterspell I was free to play a Spider, which seemed important since I had no guys on the board and my hand was quite slow. I could have waited to see if he suited up his guy, and perhaps that really was the best choice since I had played a guildgate that turn and only had two mana up, limiting the ways I could punish him for playing the aura. Ryan ended up letting the Stealer die, but played another one. My Spider was trumped by Pursuit of Flight, and he crushed me with Mizzium Skin again when I cast Eyes in the Sky on his attack step. He chose to kill the Spider, but had little follow up besides a Cancel late enough in the game that my dorks took over. These last two rounds are a perfect example why it’s best to just try to play the most powerful spells you have available in RTR Sealed. Sure, you might be able to play a decent aggressive deck, but when you stumble, you just never get back in the game. When Ryan didn’t have a great follow up to his Mizzium Skin blowout in game two, despite him being ahead I got right back into it by just playing more impactful cards. You’ll see that I stopped getting paired with pure aggro decks as the event wore on, mostly because they lack the ability to overcome a poor start. Keith had am overachieving Selesnya Keyrune, which dealt 12 damage to me in game one. But because he was wailing on me with it waiting for his bigger spells to come online, I had the time to try to set up a Revelation, which never ended up being cast. Keith ended up Supreme Verdicting because I had Stabbed something of his, but I rebuilt faster and got there. Keith told me that was his first loss of the day. I told him that would have been my first loss. 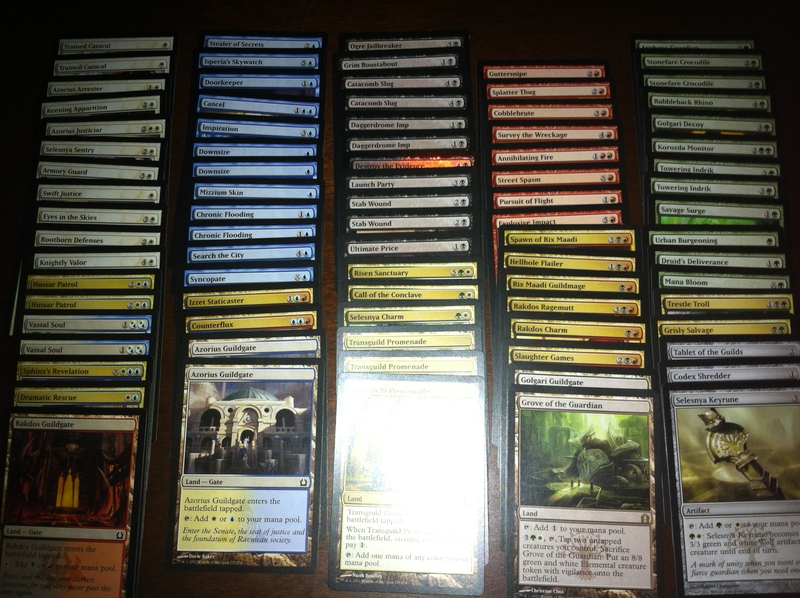 I sided in the slower cards and more instants to have more options. Game two was very similar to game one. He played his Keyrune again, but had spells to ramp into. I was attempting to get enough mana and dudes to be able to make a Grove of the Guardian token and be able to Druid’s Deliverance on the same turn to essentially counter whatever bounce spell he had, but for some reason I traded my Skyknight for a 3/3 and ended up having to wait two more turns to get it going. When I passed with the right mana up, Keith EOT played Sundering Growth on my own Selesnya Keyrune, forcing me to make a token on my turn. He then cast Voidwielder and Syncopated my Druid’s Deliverance to take game two. Game three was uneventful. Keith hit me for 12 more with his Keyrune, but drew all the weaker cards in his deck like Selesnya Sentry, Tower Drake, and Seller of Songbirds. Yes, I know those aren’t bad cards, but they were the worst in Keith’s deck. I made some 3/3s and bashed him. Having feature matches at a PTQ sounds lame, but BC Comix did a pretty good job for their first effort. Luckily for me, this round was streamed AND archived here, so you can watch it there if you so desire. Unfortunately the sound doesn’t work for the first several minutes, but again, I liked the idea of feature matches at PTQs overall. At some point those videos will dissapear from twitch.tv, probably within a few days of posting this report. If I discover BC Comix decided to archive on YouTube, I will adjust the links accordingly. Watch them ASAP, especially the games against MJ, for maximum entertainment. Just a few notes about the match. In game one, my plan was to Stab Wound him to death essentially the entire time. Once I got him to Common Bond that token, the race was on! In game two, if Andy had any extra pressure beyond his Keyrune and Centaur, the game would probably have gone to him. Also, I did think about Common Bond when I triple blocked his Centaur token. I needed a man to die that turn, and triple blocking to take Common Bond out of the picture was worth taking the extra three damage from the unblocked Selesnya Keyrune. Lastly, if I had drawn an untapped Blue source the turn after he played the Centaur’s Herald, I would have gotten to play my sideboarded Izzet Staticaster for the super blow out. Sadly, it sat in my hand the entire game, but I still won the match. How lucky, two feature matches in a row! Here’s the coverage. This match was pretty epic. Lots of maneuvering and back and forth action. MJ’s deck was pretty much the flier deck, with some premium removal like Arrest and Martial Law(which turned out to not be as great as it looks). Something you may not have caught from the coverage was MJ missing his Matial Law trigger on my Risen Sanctuary. I pointed it out late in the turn by saying “you’re detaining this guy again, right?” So yes, I did allow him to detain my creature despite the rules technically saying it was too late. I could have tried to mise a win there, but honestly, that’s just scummy. We had a fun match going on, and it was pretty obvious that my dude was being redetained from the board state. I was paid back for my generosity in the second game, where I had a Stab Wound going, and on MJs upkeep he looked at me expectantly, and I just started back. I think he grabbed a pen to mentally nudge me to state my triggers. Eventually I understood what an idiot I was being and pointed at it sheepishly. I tried to cover for it by saying that MTGO has made me terrible at calling out my triggers, and that I’d never had to declare my Stab Wound triggers so obviously before, which was true, but still, I knew I was a better player than that. As I recall, I won the game where I gave MJ a take back, and he won the game where he more or less gave me one. I ended up losing a squeaker where I may or may not have misplayed, trying to get my Stab Wound back with a Keening Apparition a little too late. I’ve reviewed the tape, and it’s hard to figure out because I can’t tell when I drew the Apparition. If you can keep track of my hand, feel free to comment here or in person what you think I should have done. Either way, MJ peeled the Dramatic Rescue off the top on a Nivix Guildmage loot to win the match in extra turns. Honestly, I’m sorta glad he did, because it cemented one of us in the top eight, where a draw would have left our futures in doubt. In both the last two PTQs I’ve played in (this one and November of last year, in case you forgot over the last 2500 words), Greg White and his brother Tim Joeseph were in attendance. It was good to have someone I knew to talk to between rounds, and at this point Greg also stood at 5-1. I avoided him, but drew his brother Tim, whom I had never played as far as I knew, but could tell he was a solid player, especially if he was playing with Greg. Games one and three ended up not being very interesting. Game one Tim only played a few spells, including a Soul Tithe and a Vitu-Ghazi Guildmage. My lie totals state he went from 20 to 18 to 13 to 8, so I likely just played out some fliers and Centaurs while Tim didn’t have much going on. Game three he kept a land light hand on the draw, essentially gambling on making top eight with a few good draws, but didn’t get there while I deployed my ultra slow hand and slowly won. My loss came in the only real game of the match, where we both had fair sized armies, but I got completely blown out by Rootborn Defenses to kill my 8/8 token and grow his centaur army. When I last ditch Stabbed his Korozda Guildmage to try to make the inevitable clash easier to figure, Tim correctly Common Bonded it and killed me in two attack steps. Still, I was moving on, and feeling rather lucky to beat a pretty aggressive deck that I didn’t match up well against. The ID made me essentially a lock for top 8. I had seen Richard, my round one opponent, playing a feature match in the later rounds, so I knew my breaks were pretty good. Unfortunately, Greg White fell in the last Swiss round to end up 6-2. The top eight was pretty stacked for a PTQ. Joining Raymond and I were Stephen Boggemes, DJ Kastner, Ben Perry, and of course Micheal Jacob. Sorry I didn’t know the other two guys, but I’m a little disconnected from the community these days. The pairings for the draft were not randomized, so I knew a rematch with MJ was in the works. Also, though I am unsure of how or why it happened, we were unable to use the relatively new ‘seeding’ rule for determining who gets the choice of playing or drawing first. I was seeded in the lower half thanks to my last round draw, so of course I was just fine with that. I opened a pretty weak pack one. Hellhole Flailer and Security Blockade were my only meaningful choices. I chose the Blockade because frankly, I don’t enjoy drafting Rakdos that much, and although Flailer is a premium creature, what makes Rakdos great is it’s removal and general curve. A 4/3 on three is nice, but honestly, any dude with a respectable body would do in that spot, whether it be Failier, Thug, or even Viashino Racketeer. A few packs later I was settling into a white based deck. What’s more, only a few picks in I had two Security Blockades and an Ethereal Armor, so I decided to gamble a little and draft a deck I’d only heard about: the auras deck. Tom Willoughby had beaten the crap out of me a week or so earlier with the ‘armor’ deck, it had come up very briefly during conversation among the players who drew the last round, and of course Ari Lax made the deck semi-famous with his turn three Fencing Ace kill(2(1+3+3+3)=10) at GP Philly this year. I knew that White was the color to be drafting in that seat, especially if I can make up for weak picks by picking up ‘useless’ Ethereal Armors that would only get better with each successive pick. By the end of pack one, I had some dorks, two Armors, and two Blockades. I hadn’t chosen whether I wanted to be Azorius or Selesnya yet, but I was leaning towards Selesnya because the slightly over-sized bodies would allow me to close games faster with my dudes that were essentially immortal in combat. There was also the idea of stretching my opponent’s potential bounce spells by making them choose between a token or an Armored creature. Sadly, I passed a Blood Crypt 13th to Ben Perry because I had to take a Rubbleback Rhino. Rubbles ended up sitting in my board. Sadface. 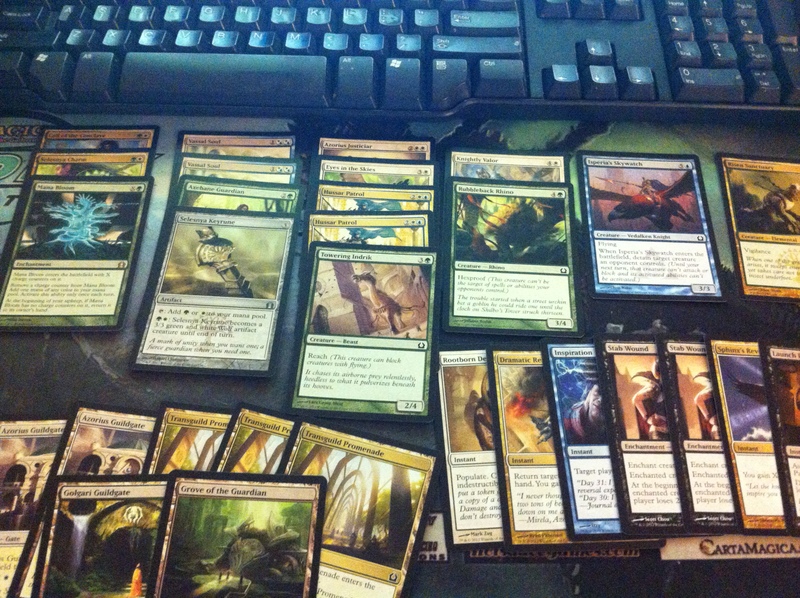 Pack two started off well, and cemented me in Selesnya by gifting me a Grove of the Guardian. After that though, not much came around besides a Palisade Giant and a third Ethereal Armor. I was getting playables, but not the kind that make you think, I’m gonna win this draft. As it turns out, DJ was two or three to my left, and he ended up some amalgamation of Selesnya and Golgari, and MJ was one or two to his left forcing Golgari. I imagine that clash caused DJ to abandon Golgari a bit late and end up three colors, also messing with my second pack. At the end of the pack, I was very confident that pack three would be very kind to me since with both DJ and I snapping up Selesnya, there was essentially nothing at all getting passed right. Yes, I brought the Wurm token from home. I was feeling lucky! Sure enough, I was shipped the absolute goods. After the Armada Wurm came a Vitu-Ghazi Guildmage and a Call of the Conclave, instantly launching my deck from mildly good to completely bonkers. I finished up with a fourth Ethereal Armor and some random dorks to wear armor. As I was building, I told Dave I was going to win, something I usually don’t do, but after laying out the deck, it just seemed unbeatable. Since I had potentially unreal starts featuring Ethereal Armors and busted uncommons alongside six drops like Armada Wurm, Palisade Giant, and Grove of the Guardian in a consistent two color deck, the angles I was attacking from focused on the two points during a game where players tend to not have much control over what happens; the very early turns and the very late turns. Most decks are either good early or late. If I failed to dispatch them early with my auras, then my rares could take advantage of an opponents already taxed resources. The only time my deck wasn’t good in my estimation was the mid game, when larger creatures start to match my enchanted men and removal can two for one me. Luckily, most RTR limited decks aren’t built to shine in the middle turns. Anytime your deck includes Trained Caracal, it’s either unplayable or insane. This deck is probably the latter. Once again, you can find match coverage here. MJ’s Golgari deck really changed my perceptions about what the non-rare laden Golgari deck does, and how it is built. MJ and I talked a little bit about his deck during and after the match. He told me that he just forced the guild in the draft, and has had great success with it most of the time. His vision of Golgari plays out like a weird combo deck, and it’s not just using Daggerdrome Imp to race. Using Golgari Decoy, MJ can permanently wrath an opponent’s board as well. Everything in his deck was designed to reach the point where he can Voltron up a guy. His supplemental cards were all intended to dig through his deck to generate card advantage and/or bin scavenge creatures. MJ eschewed guild staples like Trestle Troll that can stretch a game in favor of being completely all-in on his scavenge plan. The deck was actually well set up against my slower draws. Luckily, I drew Armada Wurm twice while MJ missed his third turn land drop in game two. Watch the coverage if you want more insight into my decision making process since most of the noteworthy crossroads I encountered were all on the attack step, making them pretty easy to follow. Note though, that in the first game, my attack that dropped MJ low but didn’t kill him was designed to encourage not blocking much damage to give me a better chance of winning the game on the next turn. If I attack with more guys, he would be forced to block a fair chunk, and it would become nigh impossible to win. I assembled, for the only time the entire draft, the unstoppable armored kitty juggernaut in game one. I’m guessing from my life going up 12, 22, 28, 34, 40 meant that I had a Caracal with an Armor and Valor on it, with a Security Blockade in play as well. DJ had a very slow draw, and I just wailed on him until he ran out of guys and died. 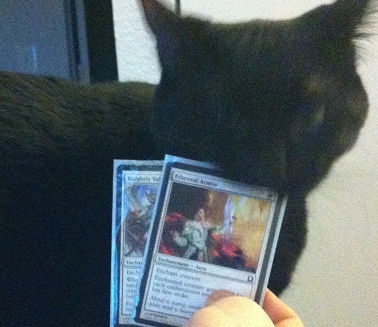 Jace (one of my cats) is practically unstoppable once he’s clad in these auras. Game two was more interactive. I had Armada Wurm, but DJ had a decent board presence on the ground, and was racing me with a Common Bonded Griffin effectively. The critical turn came when I was at three life to DJ’s five, and I played a Security Blockade before combat to get an extra +1/+1 out of my Ethereal Armor. This would also allow me to survive the next attack from the Griffin, provided I dealt damage with my naked Caracal. I didn’t do the math of it all because it was rather uncertain how the attack would play out, but wanting that extra +1/+1 may have cost me the game. 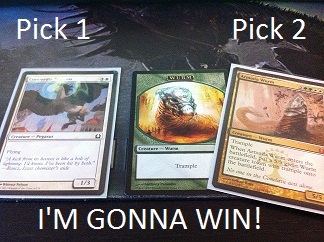 When I attacked, DJ blocked my Caracal with his Golgari Long-Legs, and cast Swift Justice on it(!) to enable him to survive the attack at three life. Moreover, my Caracal didn’t gain me any life, so I died to the Griffin the next turn with an overwhelming ground army. If I don’t play that Blockade before combat, it’s possible DJ trades his Long-Legs + Swift Justice for an Armored Wurm token, or some other block that doesn’t include my Caracal getting first striked down. If he just sits on it, which I think is VERY unlikely, he can still kill me by just pumping the Griffin. Luckily, DJ kept Stab Wound plus nothing else in game three needing a black mana, and didn’t deal me a point. Raymond made it quite clear to me before our match that he liked to chatter, certainly more so than I do, so I just left him to do most of the talking since he knew almost everyone watching, while I knew about three people. Although I kept the banter to a minimum, I got jabs in here and there. When I was at 23 and he Lobber Crewed a little forcefully, I informed him that I’ll let him know when he gets me under 20. When he Crewed me to 19, I pointed it out too. Don’t mistake that kind of banter for hostility though. We were two players in the finals of a 160 person event. It’s perfectly natural by this point to be extremely confident, to the point of playful verbal jabs. Once again, the coverage is here. Skip forward to the 11:45 mark to skip my uneventful game three against DJ. Game one, I stumbled a little on mana, unable to find the lands to cast the Armada Wurm and Palisade Giant in hand, but I mounted a fair offense with an Armored Centaur Healer. Ray had a New Prahv Guildmage that he used to bridge the gap from four to six, when he started to assemble a flying army with an Isperia Skywatch. I continued to whiff on lands, and used an Azorius Arrester to simply buy time. When the Wurm finally came down, I also had the chance to play Palisade Giant before combat, but declined because I wanted Ray to use a removal or bounce spell on one of the 5/5s to ensure I didn’t die to either Teleportal or Explosive Impact. Either were relatively likely out of his Red splash in addition to the Lobber Crew. My suspicions were confirmed when he declined to detain using his Guildmage, and a Trostani’s Judgement came down, removing my Wurm token. He went to two from the attack, and when I played the Giant after combat, I was just about sure I was going to win from 14. I chose to only attack with my Armored guys on the next attack step, crippling him and ensuring my Giant lived even longer. Ray had no answers and scooped. Game two Ray mulled to three on the play. Predictably, I played Armada Wurm on six, and Ray was gracious in defeat. Afterward, I was sort of in a daze. I shook some people’s hands, was congratulated a bunch of times, and only vaguely understood what Mike Guptil was telling me about how to contact WotC to book my flight. I had been playing Magic since 10 am, and it was now midnight. It was strange not having close friends there to celebrate with, and I left the site alone. The first person I called to tell that I won was my wife, who doesn’t play Magic, but was happy for me nonetheless. The fog on the hour long drive home was oppressive to the point where I couldn’t tell where I was, and the exit signs came and went in just a second or two. I sped through this weird, uncertain world, thinking about my weird, uncertain future, playing songs that reminded me of my weird and sordid past, and smiled. PES for running a great event. BC Comix for streaming a feature match every round. They did an excellent job, and I hope that their efforts go further in this direction. My wife for always supporting my love of a children’s game. Larry and Tony for arranging to get my lunch. You guys saved my life. My opponents (except Todd) for refusing to take a picture. WotC for discontinuing the awarding of Top 8 pins. Me for taking over a week to write this. I’ve been busy at school, ok? Pingback: Cross-Blog Link Whoring « Writing for New Media, for Fun!